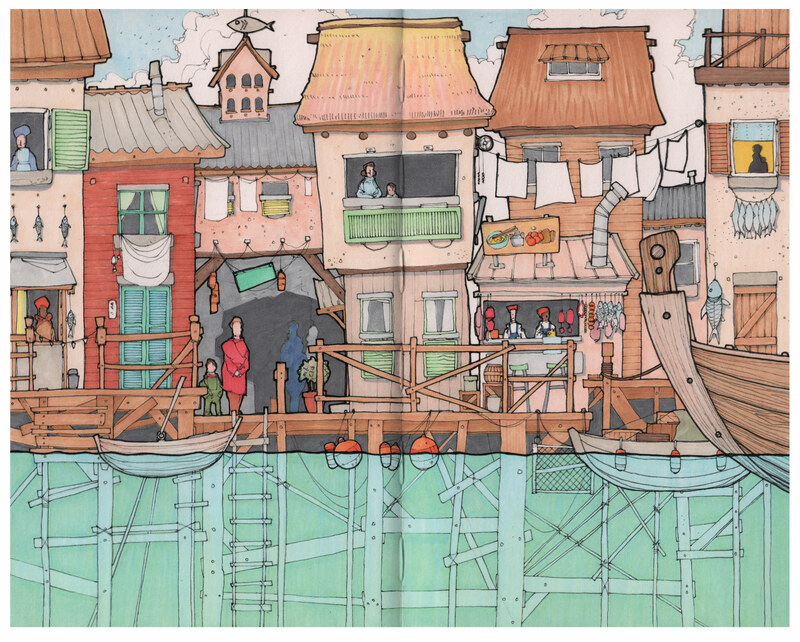 Here’s another, slightly more involved and cluttered, stilted village or city – following on from my previous post. The first image owed a lot to being in the Maldives right now, surrounded by ocean. There was also a pretty heavy influence from documentaries I’d seen on Southeast Asia – not something I’d researched, so probably just remembered very badly. This new illustration has more to do with a weird fantasy Europe from the 16th or 17th century I think. Perhaps the outskirts of a lesser Venice, or some Dutch aquatic suburbia. UPDATE: I’ve added the coloured version of this illustration now. Wherever these societies are supposed to be, in whatever century, I like them. I think next for this will be some colour, and then maybe a much larger illustration, showing a little more of this world. Love the fish weather vane! It feels like a market place, to me. People casually selling their wares. One of the best qualities is you can’t tell if this place is in the future or the past…if it’s on Earth or another planet. But it is very personal…I love the fish weather vane, too! Do you have any prints available for sale? Really love your style. Wow! I love your work! !